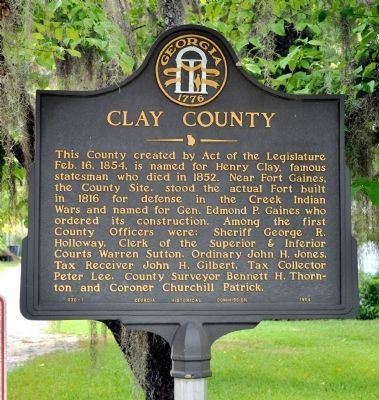 This County created by Act of the Legislature Feb. 16, 1854, is named for Henry Clay, famous statesman who died in 1852. 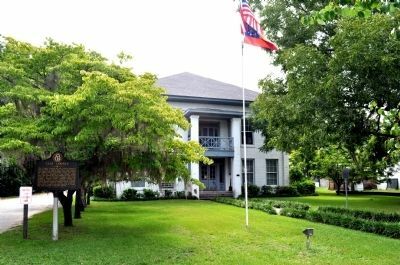 Near fort Gaines, the County Site, stood the actual Fort built in 1816 for defense in the Creek Indian Wars and named for Gen. Edmond P. Gaines who ordered its construction. 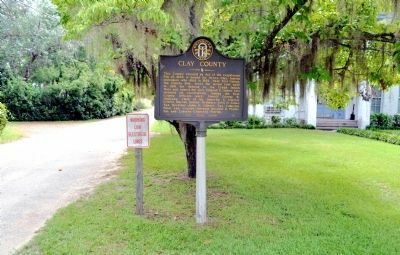 Among the first County Officers were: Sheriff George R. Holloway, Clerk of the Superior & Inferior Courts Warren Sutton, Ordinary John H. Jones, Tax Receiver John H. Gilbert, Tax Collector Peter Lee, County Surveyor Bennett H. Thornton and Coroner Churchill Patrick. Clay County Courthouse. Marker is at or near this postal address: 210 Washington St S, Fort Gaines GA 39851, United States of America. Touch for directions. Other nearby markers. At least 8 other markers are within walking distance of this marker. Gen. Edmund Pendleton Gaines (here, next to this marker); Clay County Courthouse (here, next to this marker); Queen City of the Chattahoochee (within shouting distance of this marker); Fort Gaines Guards (about 400 feet away, measured in a direct line); Historic Sites (about 700 feet away); Old Pioneer Cemetery (approx. ¼ mile away); Fort Gaines (approx. 0.4 miles away); In the Confederacy (approx. 0.4 miles away). Touch for a list and map of all markers in Fort Gaines. The marker, left, with the Clay County Courthouse in the background. More. Search the internet for Clay County. Credits. This page was last revised on June 16, 2016. This page originally submitted on October 1, 2011, by David Seibert of Sandy Springs, Georgia. This page has been viewed 500 times since then and 6 times this year. Photos: 1, 2, 3. submitted on October 1, 2011, by David Seibert of Sandy Springs, Georgia. • Craig Swain was the editor who published this page.